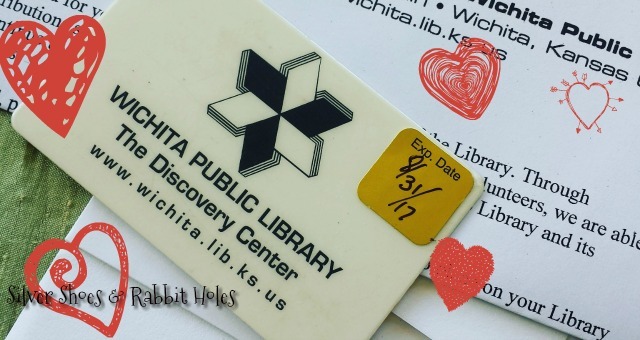 I love my Friends of the Wichita Public Library membership. Here is a small round-up of some of the books the girls and I have read in recent weeks. 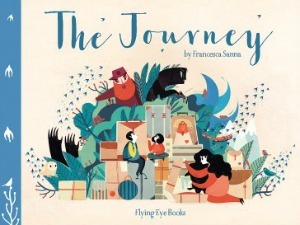 The Journey by Francesca Sanna. Flying Eye Books, 2016. I have tried to photograph this book in order to do a full blog post about it, but I give up. It's so beautiful and sad and hopeful and needs to be seen and read by all. It is the story of children from a war-town land. When the father is killed, the mother and children flee. Sanna's illustrations have a frightening fairy tale quality. In one scene, the children sleep with their mother, huddled in a forest. "But Mother is with us and she is never scared," asserts the narrator, although the tears running from her eyes tell us otherwise. 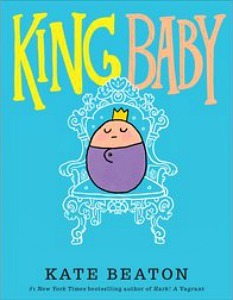 King Baby by Kate Beaton. Arthur A. Levine Books, 2016. Little Sis just had to grab this one, as The Princess and the Pony is one of her favorite picture books. It is super cute and funny. 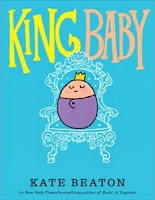 As you can guess, it's all about how a baby rules the home, much like Marla Frazee's The Boss Baby, but Beaton's hilarious illustrations definitely make this one her own. Prissy & Pop: Big Day Out by Melissa Nicholson. HarperCollins, 2016. 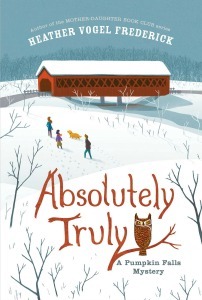 Absolutely Truly: A Pumpkin Falls Mystery by Heather Vogel Frederick. Simon & Schuster Books for Young Readers, 2014. Big Sis is participating in Battle of the Books this year, and this was the first book she read! She says, "It's about a girl named Truly Lovejoy, who moves with her family to Pumpkin Falls, NH. to run her grandparents' bookstore. A mystery unfolds there, having to do with these letters that quote Shakespeare, signed by someone with the initial 'B.' It was a really good book." I know she is looking forward to the next Pumpkin Fall Mystery, due in January! Among the Hidden by Margaret Peterson Haddix. Simon & Schuster Books for Young Readers, 1998. The first book in a very popular series, Big Sis says, "This was a very suspenseful book. It's about a world where parents are only allowed to have two children. If they do have more children, they must hide them or else the police will kill the children and get the parents in trouble. 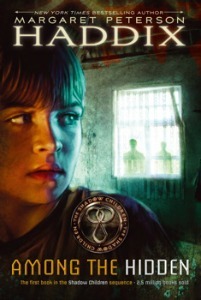 I liked this book, and someday I would like the read the sequels." 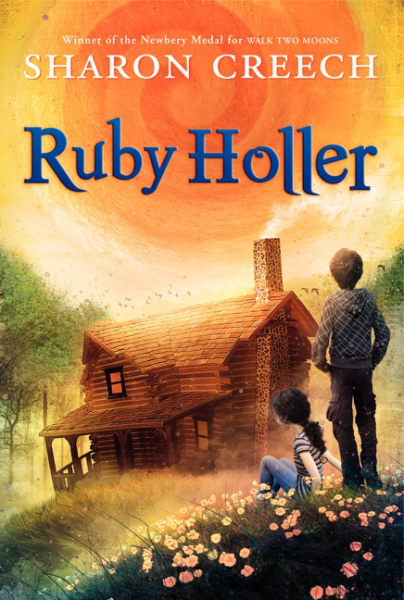 Ruby Holler by Sharon Creech. HarperCollins, 2012. She says, "I'm about halfway through it, but I can tell you it's about twins who are considered to be a lot of trouble. They are orphans, bouncing in and out of foster care. It wasn't a book I would have chosen if I wasn't doing Battle of the Books, but it's actually pretty good, so far." 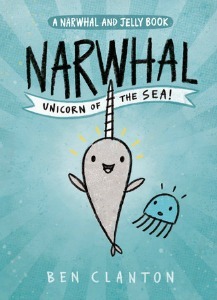 Narwhal: Unicorn of the Sea (A Narwhal and Jelly Book) by Ben Clanton. Tundra Books, 2016. Little Sis received this graphic novel for her birthday. It's too easy for her - she said she finished it pretty quickly during silent reading time - but she loved it. It definitely appealed to her sense of humor, and she does prefer graphic novels or books heavy with illustrations. She says she definitely wants the next one in the series. 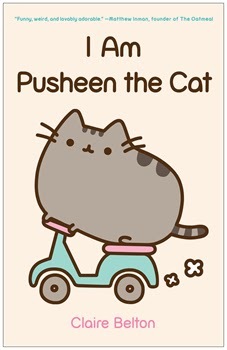 I Am Pusheen the Cat by Claire Belton. Touchstone, 2013. Okay, so there really wasn't much to read here - it's mostly pictures and pretty darn silly. But she begged for this book at the Scholastic Book Fair, and to be fair, she adores it. She has read it cover to cover multiple times. Mr. B says it's okay, it reminds him of how he used to devour old Heathcliff books when he was a kid. Phoebe and Her Unicorn by Dana Simpson. Andrews McMeel, 2014. 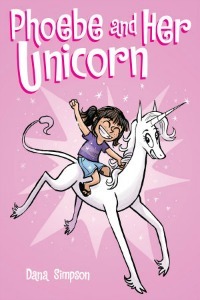 Phoebe and Her Unicorn is a comic strip both online and in newspapers, although I didn't know anything about it until I saw these books at my local indie store. Little Sis received the first one for her birthday, and she has been carrying it around in both her backpack and dance bag for over a week. She says it's an easy read (sense a theme here? ), but cute and funny. 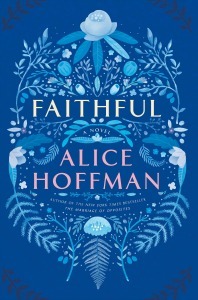 Faithful by Alice Hoffman. Simon & Schuster, 2016. I have such a soft spot for Alice Hoffman, so I was excited to read this book. What surprised me was just how much I loved it. It's a modern, realistic tale, without those touches of magical realism that weave in and out of most of her work. Shelby, the main character, was the driver in an icy car crash that sent her best friend into a vegetative state when they were seniors in high school. Shelby carries so much blame and pain, and it takes many years for her to reconcile with herself. I thought it was beautifully written, and Shelby is such a realistic character. I loved it. Other stuff: The girls and I are so excited about the new American Girl movies on Amazon Prime. They're only 48 minutes long, as opposed to the feature-lengths of the older historical character movies, but the first, Melody - 1963: Love Has to Win, is very well done. (Here's the trailer.) Next up is Maryellen's story, just in time for Christmas. Mr. B and I are working overtime, trying to get our house ready for next week. My brothers-in-law are coming to town for Thanksgiving! They live in Washington DC, and are treating us to a fancy Thanksgiving dinner out, but I still need to make my house look nice! I want to bake some pies, too. Tonight is the Fall Carnival at school, then the girls are out until the Monday after Turkey Day. December will mean major amounts of busy - dance fundraiser/performance, the school's 5th grade musical, LOTS of Nutcracker - so this will be our chance to breathe! Ok THANK YOU for the piggies. Following them now!!! I love reading about what you all are reading!! Saw the Melody AG movie but not the other one so hurray - fun that it's holiday flavored! Have a FUN T-day! I'm making a pecan pie which I hope goes well because the last time I made one, it didn't set properly. 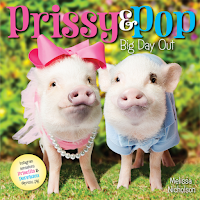 Aren't the piggies fabulous? Someone shared the little Instagram video of their Halloween on Facebook, and we all became fans. :) I made those mini chocolate pecan pies for Little Sis's birthday party. That was my first time making pecan pies of any stripe, and I plan on making a big one this week. The filling set up okay, but the chocolate chips weren't melty enough for my taste. I'm going to make another pumpkin pie, too. Oh my gosh, have you tried the pumpkin bread recipe from Smitten Kitchen? I made it for the fall carnival - I needed to send stuff for the cake walk - and because my foil loaf pans were small, I wound up with two loaves instead of one. Which meant we got to keep one, and it was DELICIOUS! As much as I liked my old recipe, I think I'm switching to hers. I am in Wichita, KS also!! I just moved here in October! Thank you for your blog!!! Sorry to reply so late! I haven't been keeping up with my blog as much lately, although I'm trying to get back into the swing of things! Thank you for commenting. A belated welcome to Doo-Dah!